Aliens from the galaxy Arachnea invade Mexico, seeking human brains to feed their queen, which is a monstrous spider. Aware of Blue Demon's role as a champion of justice, the Arachneans take human form and try to eliminate him in various ways (including taking him on in the wrestling arena), none of which succeed. After a failed attack on Blue Demon's friend Hilda, (Blanca S�nchez) she seeks out the alien�s underground lair but then gets snared in the queen spider�s web. Later, Hilda's boyfriend Jos� (Sergio Virel) is also kidnapped by the aliens and then prepared for brain extraction. 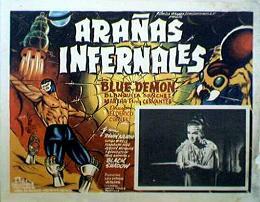 Now Blue Demon must try to save them both and put an end to the alien's evil plans on Earth. Also with Martha Elena Cervantes and Ram�n Bugarini. (In Spanish language). NOTE: This film comes from a rare Spanish import print which has the best picture quality currently available anywhere for this film. Don't waste your time and money with others, get the best version right here.